Do you have a plan for improving the odds of your retirement future being the success you imagine and hope it will be? Are you using tools such as a 401k-Checkup to help you make better asset allocation decisions as you seek more ROI and less risk? Saving for retirement is a form of gambling. By saving money now instead of spending it, we give up the use of our money today for the potential reward of having that money available when we need it in the future. Most people believe saving money is a smart bet. But the gambling with a 401k, 403b, IRA, 529 or Mutual Fund portfolio is an ongoing process that only truly ceases when investments are converted into cash or other tangibles. How well that money grows, what risk is acceptable, how we manage our asset allocations, when to pull back and where the best places are to invest money represent just some of the gambles occurring the whole time we are investing. Do you actively review the asset allocation in your portfolio or are you relying on lady-luck to make you a winner like I recently did on my birthday? My birthday is May 2. Although I currently live in southern California, I was born in southern Indiana across the Ohio River from Louisville, Kentucky. Louisville is the 27th largest city in the United States and is home to arguably the world’s most famous horse race, the Kentucky Derby. The Kentucky Derby is held every year at Churchill Downs on the first Saturday in May, having with it a tradition and pageantry unique to that area and unmatched anywhere in the world. This year the Kentucky Derby was run on May 3, 2014 which meant the Kentucky Oaks horse race was set for May 2nd, the Friday before the Derby. While the Kentucky Derby is a horse race for all 3 year old horses, the Kentucky Oaks is exclusively for 3 year old fillies. The Kentucky Derby has become a fashionable place for celebrities to be on Saturday; the Kentucky Oaks has become the fashionable place to be for ‘Kentuck-iana’ locals to be on that Friday. 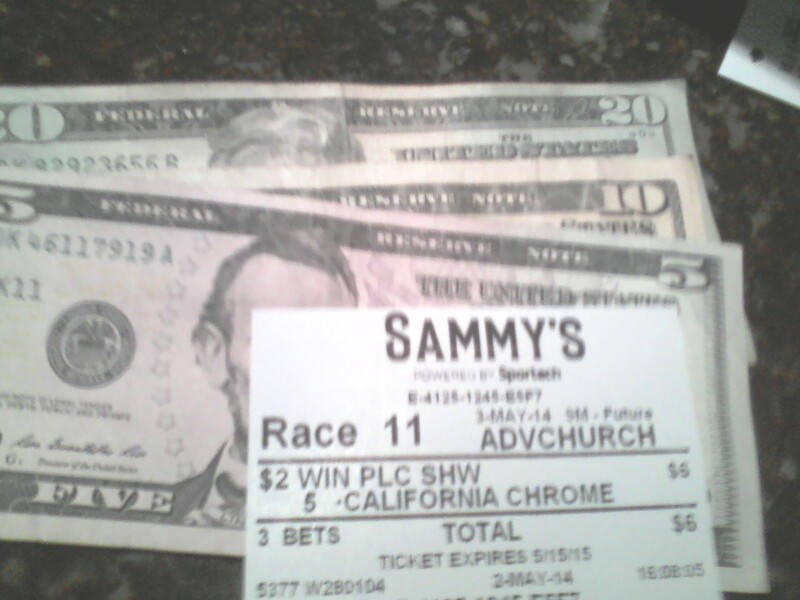 So on my birthday, I decided on the way to work that I was going to a local restaurant called Sammy’s Original that has simulcast broadcasting of horse races along with live wagering (a version of OTB, off track betting) so I could ‘attend’ the Oaks to celebrate my birthday. It was on my way to work that I even had a hunch, a premonition of which horse was going to pay off for me…I was going to win with the number three horse! Once I arrived at Sammy’s and got inside, I was immediately excited that the #3 horse was being ridden by a well respected jockey who had won the Kentucky Derby twice. In my mind, I was assured of my impending winnings. I placed my standard $6 bet ($2 to Win,Place & Show) for the Oaks (which was the 11th race of the day) and I sat down to wait for the start of the race. I sent a text to my friend from college who used to be fond of saying, for no apparent reason, “I’ve got a horse in the Derby!”. 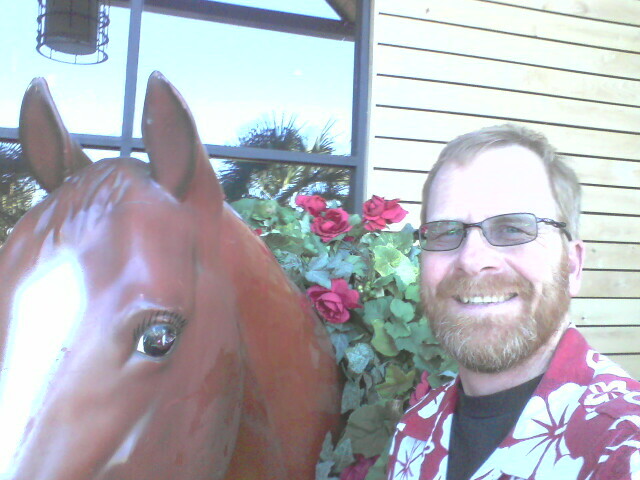 I jokingly asked him if he had a horse in the Derby. Sure enough, since he still lives in the Louisville area he had a rapid response. His response of California Chrome brought another smile to my face as I thought what good luck in getting a tip for the Derby that had California in its name; the stars were aligning for me. The Oaks was ready to start and when the gate came open the # 3 horse went straight to the lead. Grabbing the rail and leading through the second turn that colt was a full length ahead and it almost appeared the jockey was holding him back a little to save something for the final stretch run. Unfortunately the race did not end 2/3 of the way through, because at that point the pack overtook my horse and my dream for an Oaks winner. That horse nearly finished in last place! The guy besides me was happy because he had picked the winner which was the number 11 horse. Since I have historically picked more losers than winners with horses, I wasn’t too fazed by another loss and decided my # 3 horse premonition must have been for the race after the Oaks. I proceeded to place another $6 bet on the 3 horse in the 12th race. So much for that idea as again the 3 horse was no where near winning and the 11 horse again crossed the wire first. Since races were being simulcast from all over the country, my focus soon changed to the races at Santa Anita Park. I quickly reasoned to myself that my hunch must have been for a race closer to home so I once again placed my usual $6 bet on the #3 horse and sat down to see if in deed the third time would be a charm for my # 3 horse. Nope. 3 strikes and you are out is how I was feeling as I looked up and noticed how dark it was at one of the tracks, it was Gulfstream Park in south Florida. There in front of me was the 11th race preparing to be run and all of a sudden it dawned on me that #11 was my new #3. The 11 horse had won the Oaks earlier in the 11th race, and the 11 horse also won the next race at Churchill; in addition, my son wears #11 in lacrosse and both my first and last name starts with K, the 11th letter of the alphabet. That race will be my lasting memory of this most recent birthday. Halfway through that race my horse was in dead last place, but as he made his way through the pack I began to cheer quietly. Pulling down the stretch you could see him charging on the outside and as they crossed the wire the # 11 horse was clearly half a head in front and my victory was secured. I watched the replay and sure enough I was on my way to claim my winnings. 14-1 odds paid my $6 bet a little over $43. That lucky # 11 had recovered all of my previous losses and had covered the price of my lunch AND allowed me to place a wager on California Chrome in the Derby. 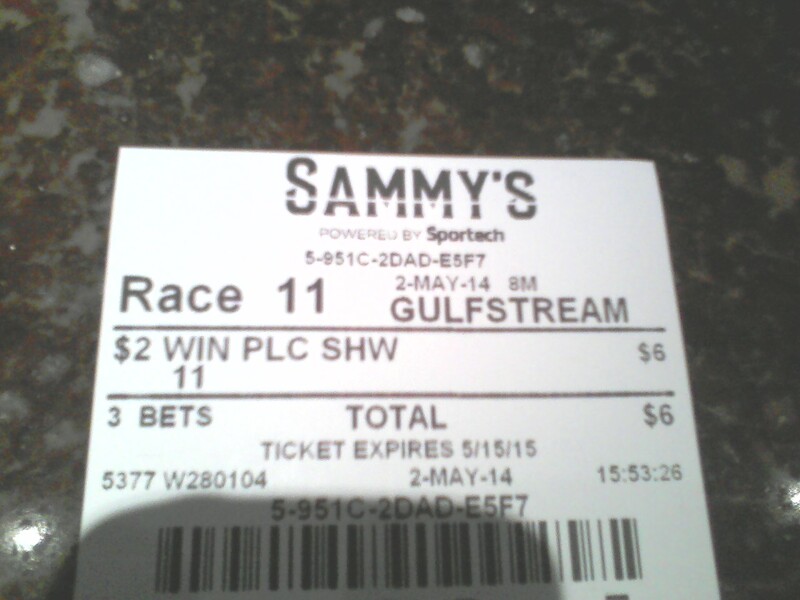 I have until 5/15/2015 to redeem my winning ticket on the Derby (which was the 11th race on Derby Day). I think I’ll keep it around as a reminder of my birthday luck! 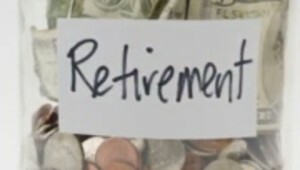 You’ve worked a long time to save money for your retirement future. $6 bets and guessing are alright if you are betting horse races. Ignoring your retirement portfolio and hoping things turn out exactly how you dream they will is quite a big gamble! If you don’t feel like gambling with your money and you want to make better asset allocation decisions, consider using a 401k-Checkup. Get easy to use information to help you make better decisions with your 401k, 403b, 529, IRA or Mutual Fund portfolio. It’s your money!